The positive impact of the process for Barton Hill is of national relevance, and not just for schools, but for wider public contexts. 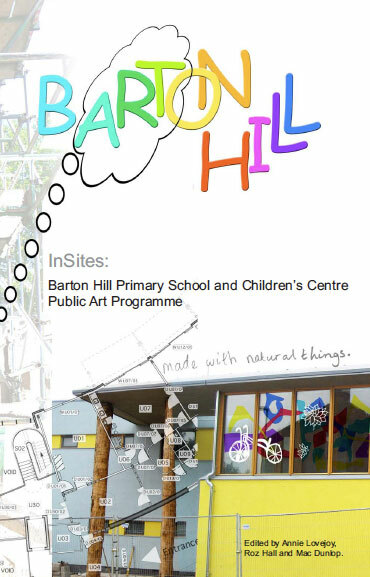 Lead Artists: Annie Lovejoy & Mac Dunlop were commissioned in June 2006 by Community at Heart (Bristol City Council), to develop and produce public artwork to be integrated into the new Barton Hill Primary School and Children's Centre. They have worked collaboratively in response to the artist’s brief and contractual targets to develop work that is relevant to the context of Barton Hill School and community. A web resource/blog traces the progress of the building and artworks whilst also providing information on local initiatives and educational curricular activities related to ecology. Dr. Roz Hall currently works as a research and evaluation consultant, across a spectrum of artistic practice, and a variety of organisations, to support artists and project directors and facilitators, to evaluate the work they conduct. Roz is also visiting lecturer and a PhD supervisor at Birmingham City University. This guide for clients published by CABE (Commission for Architecture and the Built Environment) features the Barton Hill project. document outlining the background of the project and the commissioning brief for artists.